Is the latest C4 Cactus a prickly proposition, or is it ‘softly softly’? 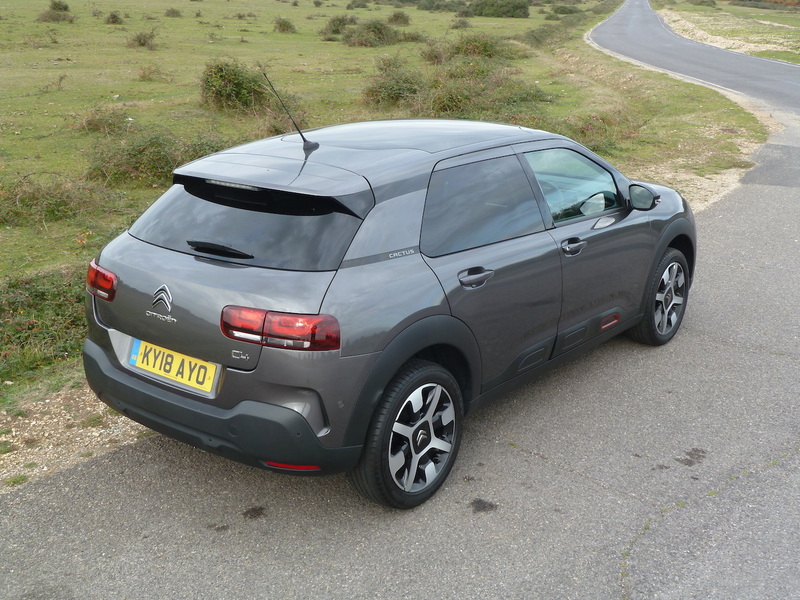 The current line-up of Citroën C4 Cactus models – all five door hatchbacks with a hint of SUV looks – arrived in Britain earlier this year, with price tags considerably higher than those of their predecessors (and now starting at £18,505 – previously from just under £14,000…), but with a host of important and innovative revisions. Notably these include a totally new suspension set-up, upgraded interiors and updated styling, in addition to the fitting of a wealth of electronic safety and convenience systems. Those on offer now include Grip Control, Safety Brake and Lane Departure Warning, plus Citroën Connect Nav, Citroën Connect Box plus the company’s Emergency and Assistance System, also Mirror Screen with Apple CarPlay connectivity/functionality. Immediately noticeable from the outside is that the latest C4 Cactus has lost the quirky large protective ‘Airbump’ panels from the body sides. These were distinctive features of the previous generation (although on the current newer car, smaller protectors are still built into the lower sections of the doors, also the front and rear bumper assemblies). However it is inside the car that even more significant changes are apparent. Citroën has applied their ‘Advanced Comfort’ programme to the new C4 Cactus, and the company also claims a world first for the installation of its ‘Advanced Comfort’ seats. These incorporate large, accommodating cushions, backrests and bolsters with a soft feel (they are said to combine high density foam in the centre of the seat with thick, textured foam on the surface), and which are also very comfortable, yet supportive too. (In fact to me they are reminiscent of a favourite armchair in terms of their comfort levels). The new car also benefits from the first use of the firm’s new suspension system, incorporating ‘Progressive Hydraulic Cushions’. This system features hydraulic cushions rather than traditional ‘bump stops’, and these are fitted at the base and the top of each suspension assembly. Their incorporation enables the use of softer-rated springs and shock absorbers (dampers), to provide a far more resilient ride than we are used to with typical rival models. Of course, the classic Citroën models of the past were renowned for their superb ride comfort, often achieved by the innovative development of advanced but complex hydraulic systems that would send most British mechanics scuttling for cover when attention was required. With the new C4 Cactus the suspension is less complicated but still clever, and potentially much more user-friendly in terms of maintenance… MacPherson struts with coil springs are used at the front, with a sprung torsion bar at the rear. 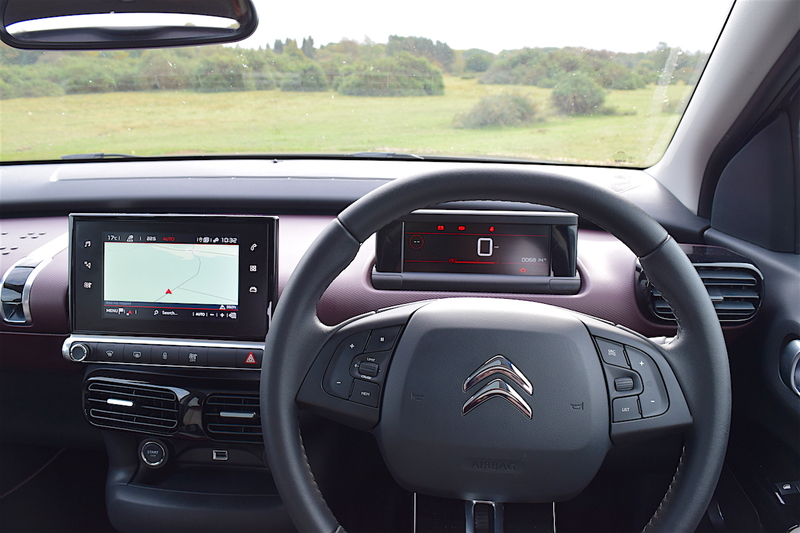 Citroën has also made great efforts to improve the perceived and actual quality of the model, with (for example) better sound insulation, thicker window glasses and an acoustic windscreen, plus improvements to the door sealing arrangements. 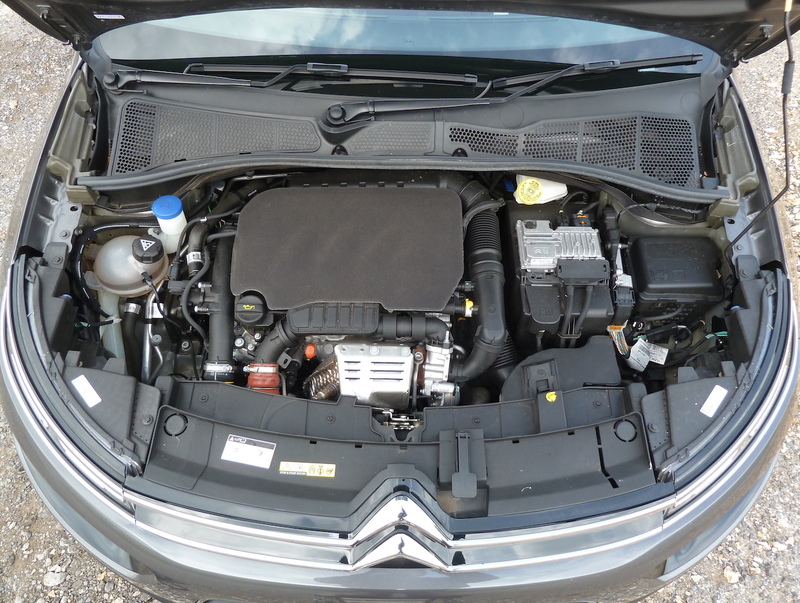 Under the bonnet of our test car was a turbocharged and intercooled 110 PS version of the PSA Group’s much-applauded three cylinder, 1.2 litre PureTech petrol engine (driving the front wheels via a five speed manual gearbox). This motor is used widely across Citroën, Peugeot and now Vauxhall models. The choice of three cylinders for this unit was made to reduce internal mechanical friction, also weight, and is said to enable the motor to produce fuel consumption and emission figures usually associated with small capacity motors, while delivering the power and torque levels normally expected from larger four cylinder engines. Alternatively, buyers of the latest generation C4 Cactus can choose from PureTech motors (still 1.2 litre three cylinder units, but producing 82 or 130 PS – the latter in conjunction with a six speed manual gearbox), or a 100 PS BlueHDi four cylinder turbodiesel. (For frequent long-distance motoring in particular, the diesel option can still make sense, especially with regard to excellent fuel consumption potential). Six speed, electronically-controlled automatic transmission is available too. On entering the new Citroën C4 Cactus, I liked the smart appearance of the interior, with its comfortable-looking cloth-covered seats, although I suspect that the very light-coloured material used for much over the upholstery might soon become grubby in appearance in everyday use. I found the seats were even more comfortable than they looked, and certainly a real revelation compared with so many of today’s mid-range models. They felt ‘squashy’ in an old-fashioned yet good way (all those who travelled in the car commented on this aspect), and at the same time over long distances provided comfort as well as excellent support. I feel that in this respect the Citroën designers and engineers have done a very good job. Welcomed too in this household was the height-adjustable driver’s seat; adjustment was quick and easy and it enabled a comfortable driving position to be achieved in seconds, for both my wife and I respectively. There’s plenty of head room for front and rear seat occupants, and the doors open wide to aid entry to and exit from the vehicle. Leg room in the rear compartment varies from reasonable to ‘less than generous’, depending on the set positions of the front seats, but there’s plenty of available width for three passengers in the rear of the car. 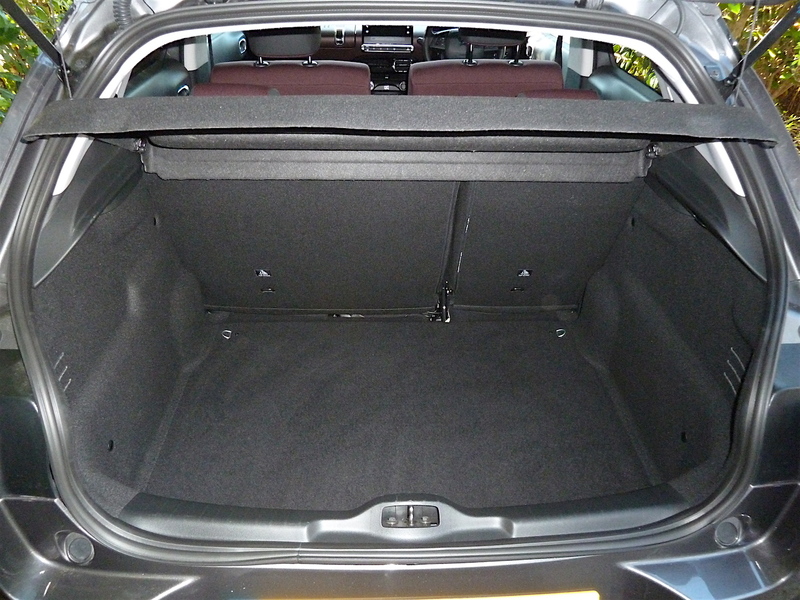 I also liked the luggage accommodation; the boot is wide, long and deep, and the lid opens high – it’s quite easy to load and unload heavy luggage over the rear sill. One potential small hazard we noted was that when the tailgate was open, thus raising the rear edge of the rear parcel shelf, the trailing edge of the shelf remained quite low, and at different times my wife and I both banged our heads on it. (It’s not sharp-edged, but it’s also not easily seen as you approach it, especially at night). If it was positioned a little higher when open, bumped heads would be less likely! When required, to permit the carriage of long or large loads, the rear seat backs, which divide two thirds:one third, can easily be folded forwards in an instant to provide a generously long compartment, albeit not quite flat. 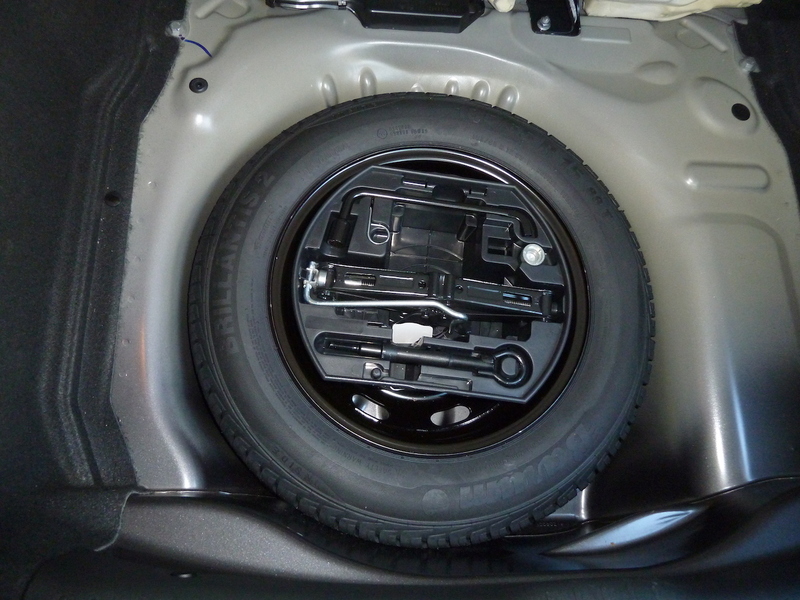 I was delighted to discover that beneath the boot floor there lives a real spare wheel. Admittedly it’s a space-saver type, but at least if a tyre on the car is seriously damaged, you can still get home or continue your journey by simply changing the wheel. Well done Citroën for still providing this facility. Smaller storage compartments abound around the car, from the deep bins in the doors, to the cup holders ahead of the gear lever, to a deep ‘box’ (with a hinged lid) in the centre console, to elasticated pockets in the backs of the front seats, to the lidded glovebox located within the top of the facia. A thoughtful touch is that on the top of the glovebox lid the designers have fitted a series of domed ‘grips’ which help to prevent items place on the lid from sliding. We found these useful to stop maps from sliding, when on the move, and they also worked well in keeping drinking cups steady when the car was stopped. 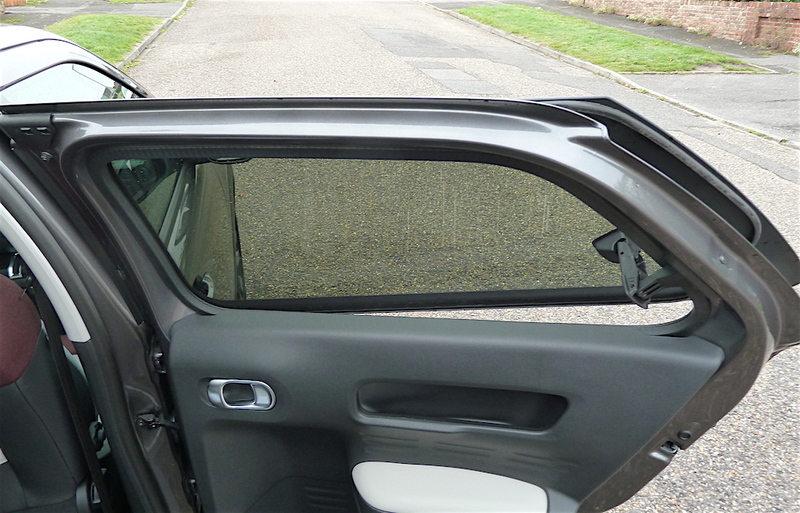 The thermally-insulated panoramic glass roof on our test car allowed plenty of light into the interior, which was welcome, but it was a fixed panel (so it couldn’t be opened) and there was no blind fitted. My positive comments about the seats apply equally to the new suspension system, which helped the test car to glide along over road surfaces good and bad, from smooth motorways to rougher-finished minor countryside by-ways, to heavily pot-holed city streets. Dips and bumps large and small did not deter this Cactus, and I felt that the ride quality was excellent – certainly far superior to that experienced in almost all contemporary rival models. I was interested to discover whether the softer, more accommodating suspension of the new Cactus C4 would result in a roly-poly dynamic response to twisty sections of road. To find out I drove the test car along a favourite series of bendy town and country roads which I use for test-driving comparisons between different cars. Result? I was pleasantly surprised to find that in fact the car felt composed and gripped very well. 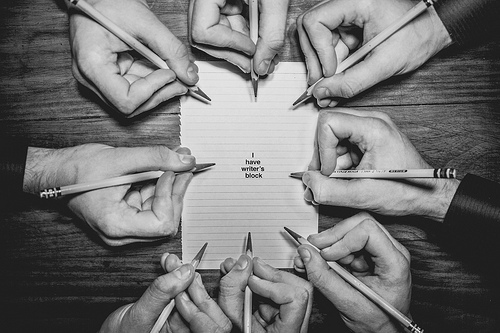 In this respect too it impressed me. It may sound obvious, but of course a three cylinder engine is never going to sound like a four cylinder motor, in the same way as a four cylinder unit is never going to sound like a six. So yes, at lower revs the motor’s characteristic note tells you that it has just three cylinders, but I didn’t find the distinctive sound loud nor intrusive. As revs rise, the engine settles to a quiet purring, and cruising at high speeds on dual carriageways and motorways proved to be relaxing. The instrument panel incorporates a ‘change ratio’ advisory graphic (to help save fuel and emissions), and I found that when accelerating gently or cruising, by the time I reached/maintained 47 mph the dash light was indicating that an upward change from fourth to top (fifth) gear was advisable. When travelling on the flat or negotiating gentle downhill main road gradients, this was fine, but when climbing long hills (for example), a change down into fourth when travelling at about 55 mph resulted in more sprightly progress and a happier-sounding engine. This was easy enough, and I found the gearchange and clutch action to be light and positive. The car has an engine stop/start system, to save fuel and emissions when it is necessary to come to a halt in traffic. This worked well too. The engine produced good acceleration from rest and on the move, and although the maximum torque output of 205 Nm or 151 lb.ft. is quoted as being delivered at 1,500 rpm, for best results I found that it was preferable to keep the motor spinning at higher rpm; this is not a criticism, just my personal observation. 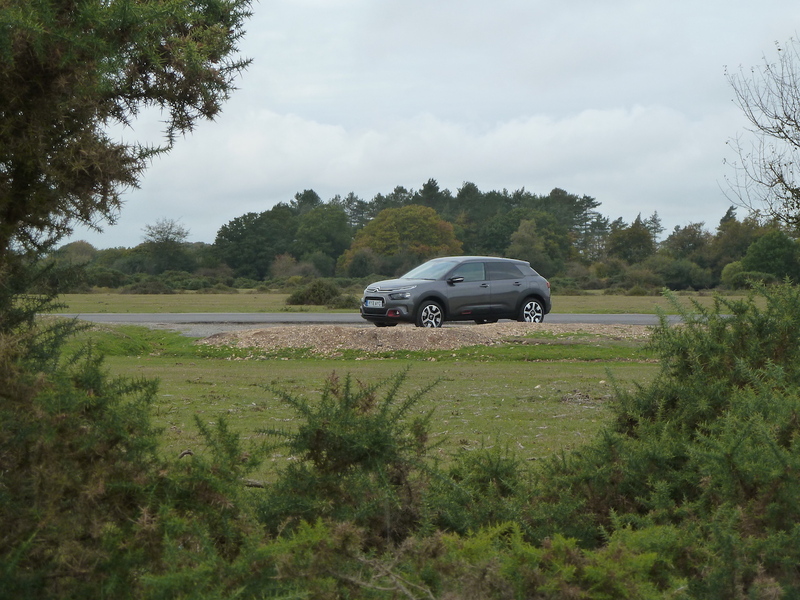 In fact the car felt lively and in performance terms was enjoyable to drive at all times during our road test. In terms of other dynamic aspects, I found that the steering (electrically-assisted) and brakes were positive in feel and I found the car easy to manoeuvre and to park, helped by the excellent reverse camera system. I was pleased to find that a traditional handbrake lever is used in the Cactus; this was positive in action and worked well on my favourite test hill. 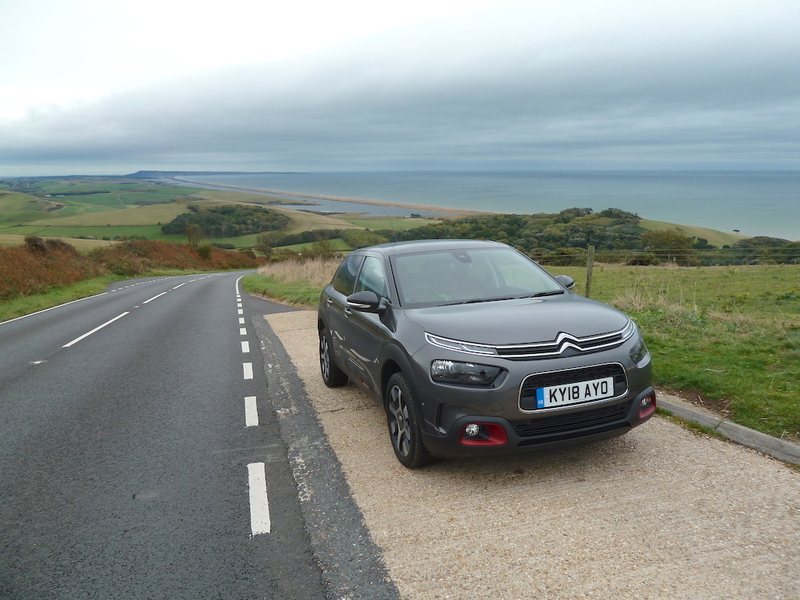 During my week test-driving this Citroën, over 311 miles it returned an overall fuel consumption figure of 45.5 mpg. This included quite a lot of town driving, and is a good result (if some way short of the official Combined figure of 55.4 mpg). For its size the car has an unusually large fuel tank capacity of 11 gallons (50 litres), providing a very handy potential driving range of over 500 miles, at the overall mpg figure achived on test. 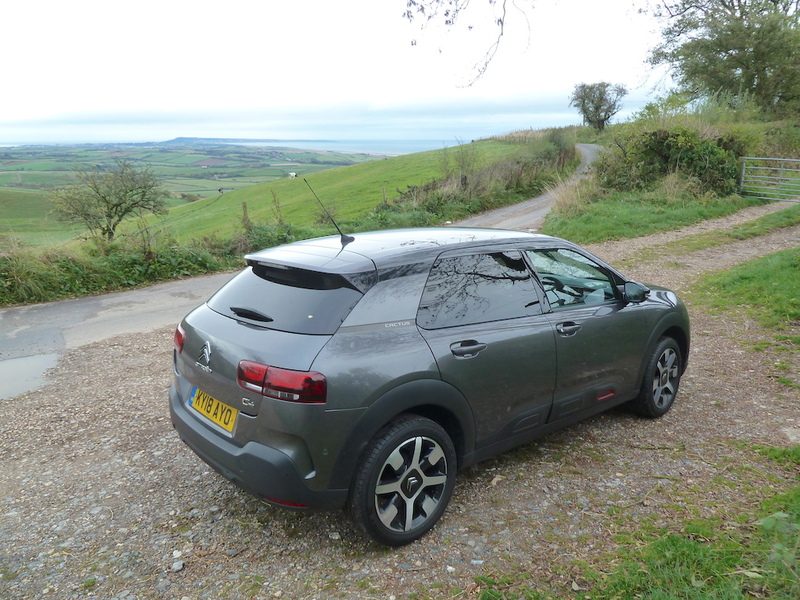 In particular, it is so refreshing to find a modern car, especially a relatively compact hatchback, with a ride quality and seat comfort as good as those provided by the latest C4 Cactus. The vehicle is also practical, with a good-sized and readily-accessed boot, it’s easy to drive and offers sprightly performance, while in real life use returning good, if not spectacularly frugal, fuel consumption figures. At a basic ‘on the road’ price of £19,990 – boosted on our test vehicle to £22,390 by the addition of extras including metallic paintwork (£495), blind spot monitoring (£200), ‘Metropolitan’ red ambience (£200), ‘Smart Access Pack’ (£250) and front parking sensors (£100) – it’s not cheap. 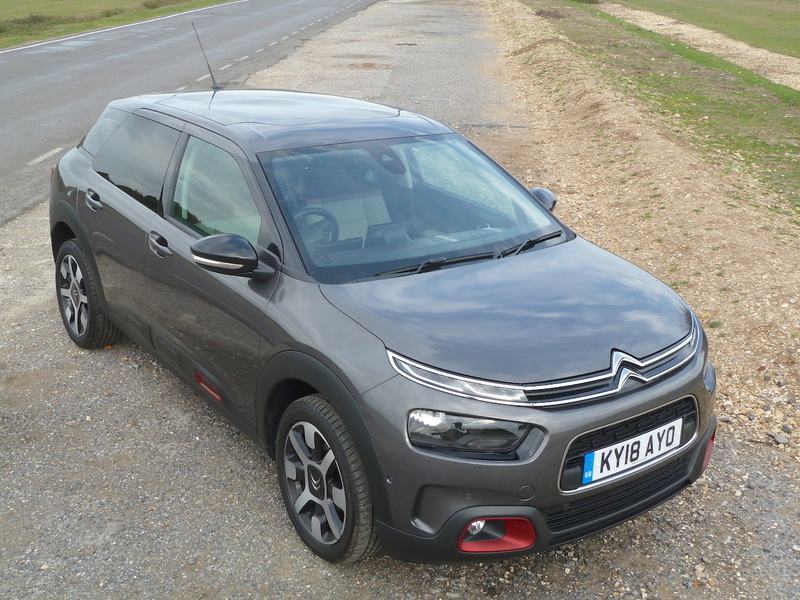 However, if you are looking for a practical five door hatchback and in particular value comfortable travelling, I would recommend taking a test drive in this Citroën model to judge for yourself. Citroën C4 Cactus Flair Puretech 110 manual. Engine: Three cylinder, 1.2 litre (1199cc), 12 valve direct fuel injection turbocharged and intercooled petrol, with fuel-saving ‘stop/start’ system. Transmission: Five speed manual gearbox; front wheel drive. Power: 110 PS @ 5,500 rpm. Torque: 205 Nm (151 lb.ft) @ 1,500 rpm. Official WLTP figures: Urban, 45.6 mpg; Combined, 55.4 mpg. Achieved during our Wheels-Alive test, over 311 miles, average 45.5 mpg. Fuel tank capacity: 50 litres (11.0 gallons). Approximate range on full tank, at our actual achieved mpg on test: Over 500 miles. 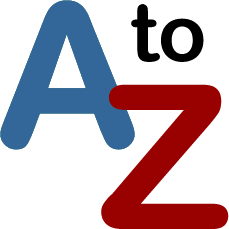 Taxation: First year, £145, standard annual rate thereafter, £140. 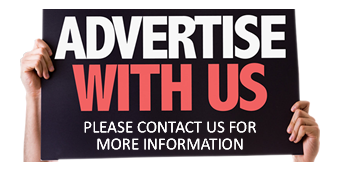 Dimensions: Length 4,169 mm (13.68 ft), Width 1,714 mm (5.62 ft); overall width, including mirrors, 1979 mm (6.49 ft), Height 1,480 mm (4.86 ft), wheelbase 2,595 mm (8.51 ft), Mass in service 1,191 kg (2,226 lb), Max. laden weight 1,575 kg (3,472 lb), braked towing weight, 950 kg (2,084 lb). Luggage capacity 358 to 1,170 litres (12.64 to 41.32 cu.ft). Price (‘On the Road’): Basic cost £19,990 (plus extra cost options on our test car, making a total of £22,390).